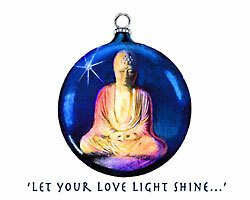 Last Minute Gifts for Christmas Delivery - The US Postal Services has stated that all packages mailed within Continental United States by Tuesday December 21 will be delivered by Christmas Day. Get your order in before 2pm PST and we will get it to the post the same day. Order a special gift, such as a crochet starter jig kit, a thread burner, a needle safe, a pair of gold plated scissors or a collection of thread & cord for a special someone on your list. We will even gift wrap by request and add a special holiday box if applicable. Please add your gift wrap request at checkout! Mahogany arrived today. All the pre-orders were sent today. Just in time for the Holidays! 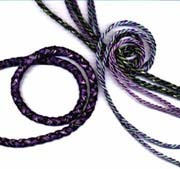 The heaviest weight of C-Lon Bead Cord has expanded to 48 colors. It is wonderful news to all of us who have discovered great uses for this cord. Some use this cord for beading, for micro macrame, for square knot or kumihimo bracelets or fashioning shekere skirts with beads for percussion instruments. This class will teach how to tie 4-strand crown knots with the use of a kumihimo disk, a method that makes this process much easier to learn and master especially when working with multiple cords. The class project will integrate the clasp with a button and loop seamlessly with no loose thread or thread ends remaining. The workshop went very well. It was sold out with 17 students, but with the help of Alice who assisted me for the day it went smoothly. Most students finished their project other than one student who had to leave early. I will be teaching this class again next year on November 11, 2011. BABE 2011, the actual show will take place on November 12-13, 2011. Sign up early for classes as they sell out and plan to come to the show! 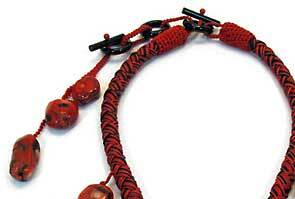 Leather cord is enjoying a new popularity for jewelry, especially when mixed with beads and nylon cord. Great primitive and modern designs include leather cord or thong as well as braided leather cord. The next installment of Tex 135, Beige & Light Blue are here bringing the collection to 16 colors. This new size, right in between the standard size of C-Lon Bead Cord and the C-Lon Micro Cord Tex 70 is especially good for working with fine bead, for crochet ropes or kumihimo with seed beads size 8/0s and smaller. Silk is getting harder to get and it is still sometimes the best choice for projects requiring the soft hand of silk. 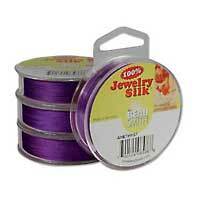 This silk is specifically produced for stringing beads. 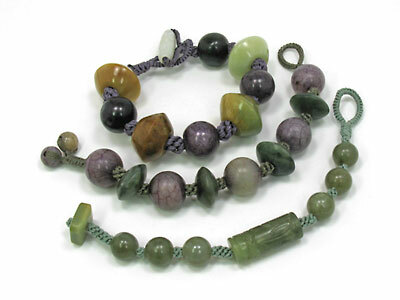 It is very smooth and strong and has just enough colors to work with many gemstones and bead. The C-Lon Bead Cord Color Mixes now has 5 sections: New Colors, listing the 5 sets of new colors by dates; Seasons, 4 collections of 16 colors from the original 64 colors matching for color type by seasons; Color Spectrum, collections of 12 colors. Plus two new sections have been added. The next installment of Tex 135, Chartreuse & Sage just arrived. 2 more colors, Beige & Light Blue are scheduled to arrive this summer. Light Copper and Shanghai Red arrived in July, Rose & Purple in June. This is the newest size of C-Lon Bead Cord and it has already gotten the attention of many designers and crochet artists... It is the cord used for the bead crochet rope shown right below, although it is possible to work the crochet rope with size 8 beads with the standard size of C-Lon Cord or any nylon #18. This new size, right in between the standard size of C-Lon Bead Cord and the C-Lon Micro Cord Tex 70 is especially good for working with fine bead, for crochet ropes or kumihimo with seed beads size 8/0s and smaller. May 30, 2010 - Tools for Crochet + Tubular Bead Crochet, the Easy Way! 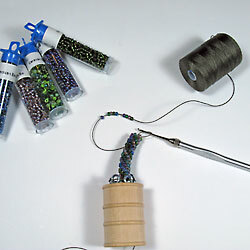 The tubular bead crochet jig and tutorial from StudioDax, patent pending, is not widely available. If you have struggled with this technique, had a hard time with the beginning of the tubes, or always wanted to learn, find out about this method. For more info read my latest blog entry. The newest 8 colors C-Lon Bead Cord are here - This brings the full collection to 104 colors! Wow, all the color choice s... I remember the days of 12-25 drab colors for the upholstery industry. This is really beyond my wildest dreams. The up side of all these choices is the ability to find the exact color desired. The down side is keeping track of all the colors. It is getting harder to keep track of all the color names. Most orders are accompanied by a color sheet with all the colors listed. I highly recommend that you mark the colors you purchase and/or keep a swatch with the color names. Another option is of course to buy a set of samples cards. Peach Glow is in between White and Sea Shell. It is a warm off-white or ecru as we say in French with a soft pink glow. Renamed as Heavy Cream matched the samples but not the produced color. Blush is in the same color range, a stop darker than Sea Shell with antique rose undertones. Heavy Cream, Sea Shell and Blush make a beautiful ombré. Mahogany has some of the same tones, but much deeper. It also fits well as a deeper tone right after Ginger & Nutmeg. Brown or Sienna would be the next step deeper or redder respectively. Chinese Coral is very distinctive. It is darker than Pink Lemonade. Wheat fits right after Vanilla and Cream. Dark Tan is the next darker color in this group. Lemongrass is a great fashion color, lighter and more gold than Olivine, softer than Chartreuse. When compared to the other gold tones, Gold would a coppery gold, Marigold brighter, Antique Gold softer, Light Maize a bit greener, whereas Lemongrass has a definite green tone. Blue Morning is a light blue, lighter than Light Blue. 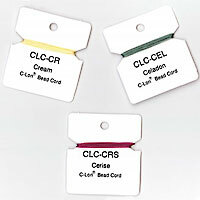 The new C-Lon® Fine Weight Bead Cord is the latest addition to the C-Lon family as of Feb 2010. As its siblings, the C-Lon Bead Cord (standard weight), the C-Lon Micro Cord (extra fine weight) and the C-Lon Tex 400 Bead Cord (heavy weight), it is a bonded 3 ply twisted multi-filament thread with diameter of 0.4mm and a 24 lb breaking strength. 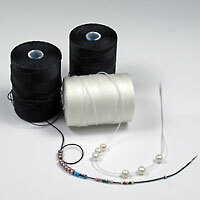 Good for micro macrame, stringing beads and other techniques such as bead crochet, finger weaving, kumihimo, tatting as well as many other uses where a strong bonded nylon is required. 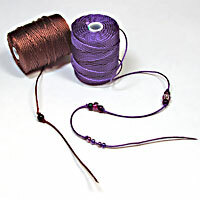 Especially good size for fine bead, for crochet ropes or kumihimo with seed beads size 8/0s. New color sample cards of all the 104 C-Lon Bead Cord colors are now available. They represent a tremendous amount of work by C-Lon and minimal mark-up all around, well a labor of love at the $42.00 price for 100 cards. If you already previously ordered the set without the latest 8 colors, complete your collection for $4.00. This visual presentation will tell you all about cords and thread, from how they are made to the different types available, then take you on a tour of some of the stunning works being done by artists worldwide with a variety of techniques. Sponsored by Region 2 Arts Council and Dawn Standera. 7:00 pm. No entry charge, open to anyone interested. Beltrami Electric Cooperative Room, Bemidji, NM. This class will combine the program of Cords & Braids, plus many aspects of How to End Kumihimo Braids, and Turk Head Knot. The program description is available in a pdf format. Class $85 + Kit $15.00. Sponsored & funded in part by the Region 2 Arts Council. Organized by Dawn Standera. The student kit is payable at the workshop. To register send a check in the amount of $85.00 to Region 2 Arts Council, 426 Bemidji Avenue. Bemidji, MN 56601. You are registered once R2AC receive your check. Learn how to set a cabochon in a micro macrame setting with nylon & silk thread and how to add free form knotted leaves, flowers and stems. This workshop will teach a method to set cabochons without the use of any glue, by caging it with double half hitches, thread and one wire. 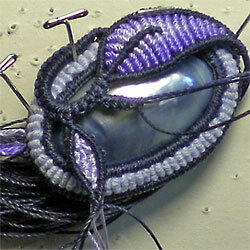 It will also introduce free-form Cavandoli knotting. Knowledge of double half hitch is a prerequisite. Several tutorial are available to download. Class $200 + Kit $25.00. Space is limited. $100.00 deposit to sign-up, balance due at workshop. Email or call at (530) 774-2244 for more info.